I have the opportunity to purchase an Asus P4PE motherboard on eBay, but it is missing the plastic heat sink mounting frame. It is a brand new board, but the frame was pirated for another board, says the seller. Any idea where I could find one of these frames? I have been scouring the Net and can't locate one. Maybe what I am looking for doesn't exist without buying a whole board? Some after-market P4 CPU coolers come with a frame, which may be completely standard or may be a special version to suit that particular cooler. Either way, that'd solve your problem. There are a few places that sell brackets that aren't made for some particular motherboard, too; here and here, for instance. The only other option, as far as I know, is to find another frame on a dead P4 board. Any place that assembles and services PCs probably has a wrecked board or three that didn't make it into the RMA system, for whatever reason. They might be able to help you out. The Tokyo Marui model Type 90 tank is sold in the US by Sportsman's Guide for $US120. I'd been thinking about buying it, so I searched the Web and found your beautifully written review near the top of Google's listing. Amazingly, your review convinced me not to buy this model! It appears it's more of a mobile gun than a model tank. And I'm more interested in the latter than the former. The Marui rubber-track tanks are, indeed, not really crusty off-road monsters. You can, by the way, get proper articulated tracks for them as a hop-up option (HobbyLink Japan have the Type 90 tracks here, and tracks for the later Abrams and Leopard 2 models here and here), and those help a bit. But the tanks are still weak as a kitten. You could harness up six Marui tanks like oxen and a Tamiya 1/16th scale tank (this one or this one, for instance...) would still be able to beat them, easily, in a tug-o-war. I want to know (in plain English please - so I don't mess it up) how to connect my Gateway 500 to my Dell PC in a network so that we can share the cable Internet connection on my Gateway, and I can access files on my Gateway when someone else is using it. Also, can I access any files on the Gateway via the connection when I'm using the Dell, and vice versa? Please be nice, I may be blonde and a bit unsavvy when it comes to technology... I'm a total end user. But if you could explain what I need and what to connect to what... maybe between me and my sister we could get this network working. My nephew also wanted to know if both he and his friend could play EQ over a network set up like this. My sister said she didn't think so... I'm clueless. What do you say? It's easy to do what you want to do, if the computers each have a network adapter. You can connect them together with a "crossover cable"; for a network of more than two PCs you need a hub or switch with each computer plugged into a port, but for only two computers a crossover cable will work. Some network adapters don't like crossover cables, but practically any cheap network adapter from your local computer store will be fine with one. You can buy crossover cables that are long enough for computers practically anywhere in a house to be connected to each other, provided you can physically run a cable between them, of course. The cheapest network adapters are PCI cards, installed in the PC like any other card. You don't mention which version(s) of Windows you have, but if it's anything from Win98 onwards, and if your computers have at least one free PCI slot each and sufficient free system resources for another expansion card (which they probably do) then you don't need any special kind of network adapter. The cheapest one on the shelf should come with drivers that work with your version of Windows; current Windows flavours are actually likely to have built-in drivers that work with whatever card you choose. If you don't want to open the PCs to install network adapters, you can get USB adapters that'll work, too. They just plug in like any other USB device (and can connect to each other via a crossover cable, once again), but they're more expensive than PCI network adapters. If both computers have USB 2.0 ports (the 500-series Gateway machine should, but I don't know about the Dell) then you'll be able to use USB 2.0 network adapters that're as fast as a PCI card. Otherwise, you'll be stuck with 10BaseT speed instead of 100BaseT, which will make large file transfers rather sluggish. You won't notice the difference most of the time, though, and 10BaseT is more than fast enough for Internet sharing. If you don't want to bother with a cable, you can use a couple of wireless network adapters, which can also be had in PCI or USB versions. They're more expensive again and somewhat trickier to set up, but 802.11b adapters (as opposed to the newer 802.11a and 802.11g standards) aren't nearly as expensive as they used to be, and will work from one end to the other of the average house with no trouble. I most recently talked about wireless networking here. Recent Windows versions have quite good networking setup information in their standard help system (click on the desktop, press F1), by the way. You can, indeed, share resources between your two networked computers, but you have to tell Windows what you want to share first. Your nephew and his friend will also be able to play EverQuest over the shared connection, provided they have two accounts, of course. Windows' standard Internet Connection Sharing will let them do this with no trouble, provided you don't run out of Internet connection bandwidth. Your cable connection will be fine for this, but dial-up modem connections are unlikely to allow more than one person to play an on-line game at once without nasty lag problems. How would I work out how big a UPS to get to power about 12 or 13 computers long enough to shut them down in the event of a power failure? I don't need all the monitors to be powered, as I can shut down the computers remotely. They are Athlon XP systems without any expansion cards (all onboard - Graphics/Sound and LAN) with 300 watt power supplies. Is a UPS the best thing in this situation for power conditioning as well? Where I live has been known to get a few power surges, and whilst I have been lucky so far, I have seen a lot of computers where some magic smoke escaped and they stopped going because of these surges. I am about to re-wire, so was looking at a UPS solution on the power circuit for the boxen. To figure out what you need, take the most current each computer can be expected to consume - which you can work out with a clamp-on RMS AC ammeter and some fiddling around - add the current figures together, multiply by 230 to get a plausible wattage figure (or 115, if you're in a country with 110/120VAC mains power), multiply by about 1.65 to account for the nasty power factor of PC switchmode power supplies, and you'll have the minimum volt-amps (VA) a single UPS will need to supply them all. Unless they're seriously stacked machines then they're not likely to be drawing more than about half of the 300 watts their PSUs can (theoretically) deliver; if they all want around 150 watts while you shut them down (they may well want considerably less, but headroom is good to have), then 13 machines will need about a 3200VA UPS. You can, of course, kit each machine out with its own individual UPS, but that may prove to be a big pain when the batteries all start hitting their use-by date at once. A single brand name UPS in this power category won't cost you much more than a bunch of cheapo small units. See this APC UPS, for instance. If the machines turn out to only need around 2000VA, you can get away with spending rather less. A good UPS should provide perfectly adequate powerful conditioning. A bunch of cheapies might not. It's generally fine to put a hefty power conditioner between your big UPS and the wall, if you've got a lot of aluminium smelters and mad scientists in the neighbourhood. Do CRT monitors damage your eyes? I did some research on the Net and every site said "they don't cause any permanent damage - just temporary eye strain". My dad reckons that me playing Counter-Strike a lot is going to make me need glasses. Monitors don't damage your eyes. Well, no more than staring at anything else that close to your face all day will. Back in the old days when monitors tended to have a high static charge on their glass all the time, they tended to shoot dust at the user (any highly charged object will do that - neutrally charged dust is attracted to it because of the potential difference, then gets charged up like the object, and is then repelled because that's what similar charges do). That, and the low refresh rates we had to use with older computers, was a pain. But even those monitors didn't do any permanent damage, by themselves. Close focusing for long periods of time may harm your eyes, or cause people who already have focusing defects to get worse faster than they otherwise would, but the jury's still out. Here's a Straight Dope column on this subject. I remember a while ago there was an "Ice Cap" cooler. Not sure if it had a fan. All I remember was that if you switched it on and touched the bottom it would go cold. Do you know who made them and how they work? I want to use one for another application. That'd be a cooler with a Peltier device stuck on the bottom of it. I've got info about Peltiers here and here. I am trying to source four satellite speakers for my surround sound TV. I am thinking of using computer speakers rather than paying $300.00 for four poor quality speakers. The problem is that most computer speakers come with set length cables and don't have removable cable plugs. Any idea where I can find small satellite speakers with plugs in the rear so that I can attach different length cables to the speakers, without getting ripped off? Many computer speakers do have the problem you mention, but it's surmountable. If the satellite speakers have regular two-core figure-8 cable, then anyone with a soldering iron, some solder, a wire stripper, a roll of zip cord and some electrical tape (or heat-shrink tubing, for neatness) can add a few metres of cable with no trouble. That's pretty much Elementary Soldering Job #1; anybody with rudimentary hand-eye coordination should be able to get it right within half an hour of first picking up a soldering iron. You just have to make sure you don't reverse the speaker polarity by accident; out-of-phase speakers sound lousy. Speakers with figure-8 cable and some kind of plug on the end require more cable grafted into the middle of the existing lead; subwoofer/satellite setups with ordinary spring terminals on the back of the sub and bare tinned wire ends on the satellite cables let you just add more cable to the end of the existing ones. If you don't want to do any soldering, or if the speakers have coaxial cable leads (for line level input or for speaker level output, or for both), then you can extend the cable by soldering (unless it's nylon-and-copper wire, which is tougher than plain copper wire by practically unsolderable), but it's more annoying. Instead, you can just get an extension cable from an electronics or hi-fi store. Many sub/sat systems have coaxial cables to the satellites, with RCA or 1/8th inch plugs on the end; 1/8th and RCA extension leads (male plug one end, female socket the other) are easy to find. They're not actually a good choice for speaker-level signals, but these aren't big beefy speakers and so no harm will be done. For line-level signals, they're perfectly fine. 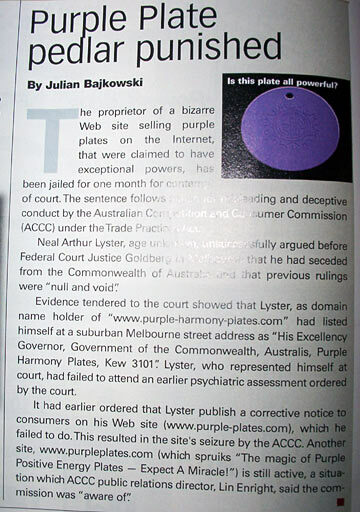 I spotted this article in the February edition of ARN Australian Reseller News, which I think may have some strange connection to your "Clash With the Quacks" articles. I apologise for the poor image quality; didn't have a scanner at work, but the shot from the digital camera I'm currently testing should be almost readable. Yes, there's obviously a connection there, though all purple aluminium magic health, food and fuel economy enhancing things aren't necessarily made by the same people, of course. They're on sale in every nation where gullible people can be found, I think. Incidentally, the same chap's attempt to avoid prosecution is something of a psychoceramic gem; see the PDF file here. There's a barrel-o-laughs court transcript here. Both of the above links are to a site belonging to someone having to do with those bastions of independent thought, the Principalities of Caledonia and Camside, a closely related pair of self-declared pseudo-nations here in Australia. These sorts of places are leading world producers of sentences that end with the words "and that's why we don't have to pay any income tax", and are frequently amusing for various reasons. Their opinions about what they call the US National Economic Security and Reformation Act, for instance (proponents of this proposed Act don't quite seem to agree about what it's called) score a mention on the excellent Quatloos! site here.